Close your eyes and say it again. I'll go out on a limb here and guess that a fair few of you are picturing Maverick, all Aviator shades and white-toothed grin. Take a moment here. Think about it for a second. We are living in a time when we have a grade A film star making movies. There are many actors, many better actors, but there are few, if any, bigger or better film stars. I'm just going to put it out there, Tom Cruise is fantastic. Tom Cruise is why films are amazing. Tom Cruise is a force for good in cinema. Welcome then, to the second in my irregular series looking at my film heroes. The Scientology shaped Elephant in the room. I'm going to get this out the way really fast. I don't care that Tom Cruise is a Scientologist. I don't care. Not a bit. He believes in something that appears utterly ludicrous, but then so do many people. I'll judge him on his films thanks, and leave his beliefs in the foyer. The most '80's photo ever? I started getting into films at around the time when young Tom started breaking through, and this left an indelible impression on me. Top Gun, Risky Business, The Colour of Money, Legend, Cocktail, and Rainman are all stellar movies. And then he went and made Born on the Fourth of July. Oliver Stone was a fantastic director in his prime, he even convinced people that Charlie Sheen could have a future as a serious actor. So here Tom was, a product of youthful, exuberant movies changing up a gear and starring in a scathing film about the post-conflict effects of a generation of soldiers from Vietnam (both physical and psychological). He was a long way from Maverick. But he went back to Maverick in a way with the release of Days of Thunder. A great film? Nope. A terrible film? Definitely not. 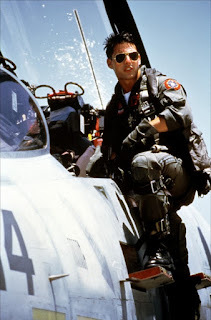 But the hype train was all about getting the Top Gun team back together and the reviews weren't forgiving. And maybe there's something from this that influenced this period. The mid-nineties saw the Cruise move away from the popcorn roles and move into meatier parts. A Few Good Men ("I want the truth"... you fill in the rest), Interview With A Vampire, Jerry Maguire, Eyes Wide Shut, and Magnolia all point to someone who wanted to expand his range as well as his audience. And then he got involved in Mission: Impossible (that's the franchise box ticked then). Maybe it's to do with his name, or the money that he's pulled in during his career but Tom Cruise doesn't get the credit he's due for his acting ability. Look at his filmography, it's insane how many different roles he's acted, let alone genres he's starred in, let alone box office successes. There's not too many turkeys in there (just don't mention Vanilla Sky). Money where his mouth is. There's one area where I think Tom Cruise beats everyone. Science Fiction. In a time where almost every sci-fi film is trying to start a franchise, Tom is busy putting out super high quality one-off sci-fi movies. Minority Report, War of The Worlds, Oblivion, and Edge of Tomorrow are all great films that fly in the face of the reliance on franchises to to the business. And yes, he has made 5 Mission: Impossible films (with a sixth coming soon), but I'll let him have those because he never went back to Top Gun. And in a post-Taken world he is clearly enjoying the status of middle-aged action hero, and doing a much better take on it than almost anyone else. I cannot wait for American Made. It looks great fun. Here we have a film star who clearly doesn't take himself too seriously which is massively refreshing in these days of po-faced actorly types.